Duolite® Offers Both Maximum Privacy and Ultimate Light Control in a Single Window Covering, Putting Day-Night Convenience at Your Fingertips. The Duolite® dual-opacity option for your window treatments perfectly answers your desire for the best of both worlds — soft, natural light or soothing darkness. 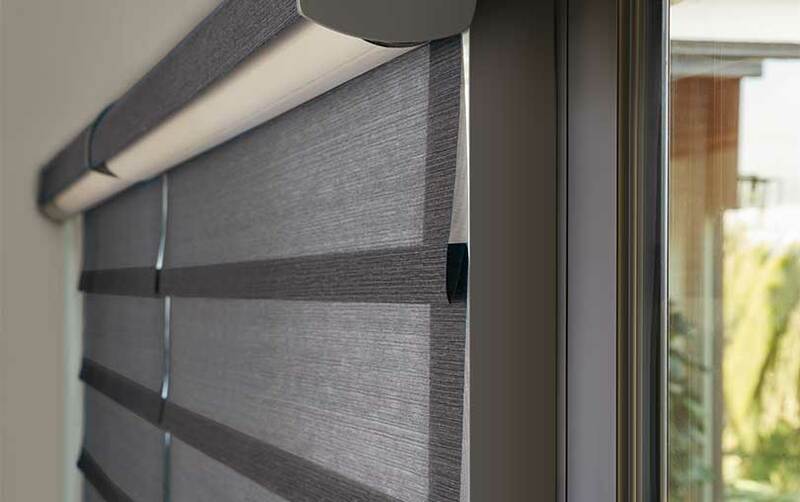 Two shades in one, the Duolite® feature offers maximum light control by using two separate fabric panels to achieve a 'day/night' level of convenience, providing limitless options for privacy and light control. The Duolite® operation is used in conjunction with other Hunter Douglas operating systems, including PowerView® Motorization. Introducing Vignette® Modern Roman Shades With Duolite® — Imagine a Roman shade that has uniform, contoured or flat-fabric folds, and no exposed rear cords. Now consider that shade in a light-filtering or sheer fabric with a second room-darkening back panel — both of which roll on a single headrail/roller. It's day-night convenience at your fingertips. That's the new Vignette® Modern Roman Shade with optional Duolite®. Vignette® Modern Roman Shades with Duolite® in the Belfast Linen fabric. The Vignette® shades are shown fully lowered/closed. Note their light diffusing opacity. The rear Duolite® panel can be independently operated from open to partially drawn, and then completely drawn for a full room-darkening experience. Vignette® Modern Roman Shades with Flat Fold and Duolite® close up. The Vignette® shade is shown fully lowered/closed. A rear Duolite® panel can be lowered from the same headrail/roller, offering room-darkening capability and total privacy. Vignette® shades are available in several styles featuring wrinkle-free fabrics and no exposed rear cords for child safety. All styles are now available with Duolote®. 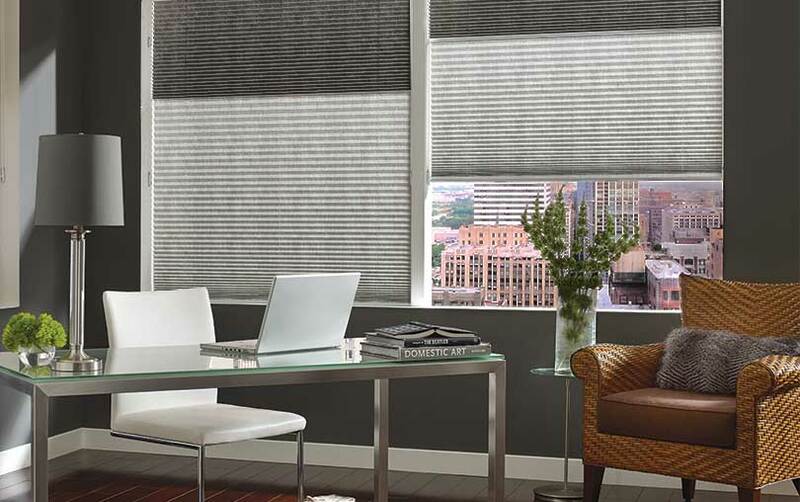 Learn more about Vignette® Modern Roman Shades including sizes, colors and operating systems. The Silhouette® Window Shading with Duolite® product offers the same light-diffusing benefits of a regular Silhouette® with an integrated room-darkening roller shade. Close up of Duolite® panel behind a Silhouette® window shading. The Duolite® is partially lowered to add room-darkening capability. Close up of Duolite® panel behind a Silhouette® window shading. Depending on fabric choice, Silhouette® shadings can filter out up to 88% of the sun's UV rays, protecting your valuable possessions. Learn more about Silhouette® Shadings including sizes, colors and operating systems. When you order your Duette® and Applause® cellular honeycomb shades with Duolite®, you are really getting two shades in one. A translucent honeycomb shade with superior light diffusion is combined with a second opaque section of shade on a single headrail. The different sections can be raised or lowered to set the privacy and light level. Set the entire window covering to the sheer section to allow maximum filtered light penetration. Use the opaque room-darkening section for maximum privacy. The sections can be adjusted depending on light and privacy needs throughout the day. The Duette® shades with Duolite® feature two sections of insulating honeycomb design that can be adjusted to suit light and privacy needs. Duette® Architella® with Duolite® features an insulating honeycomb within a honeycomb design in addition to sheer fabrics for light diffusion. Hunter Douglas pioneered the honeycomb shade with the Duette® line. 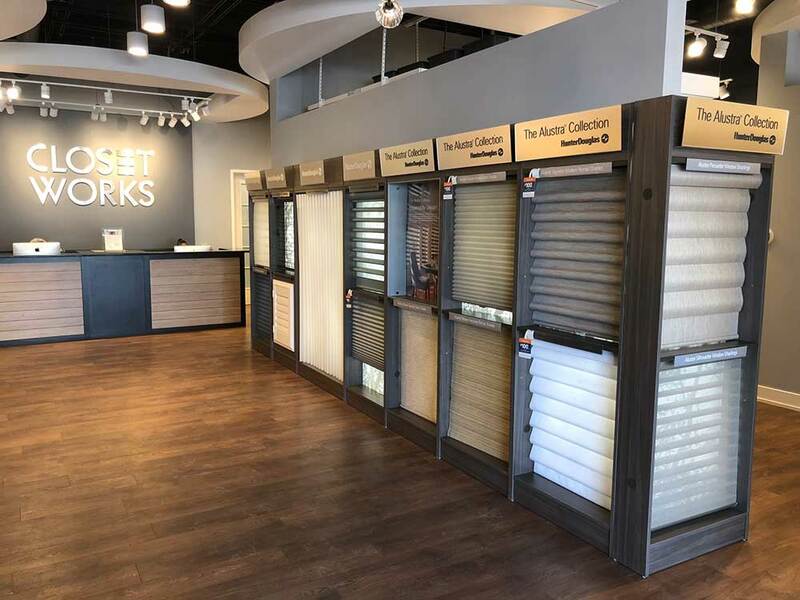 These window treatments are specifically engineered to provide beauty and energy efficiency in both cold and warm climates. Duolite® adds complete control over privacy and light diffusion on a single headrail. 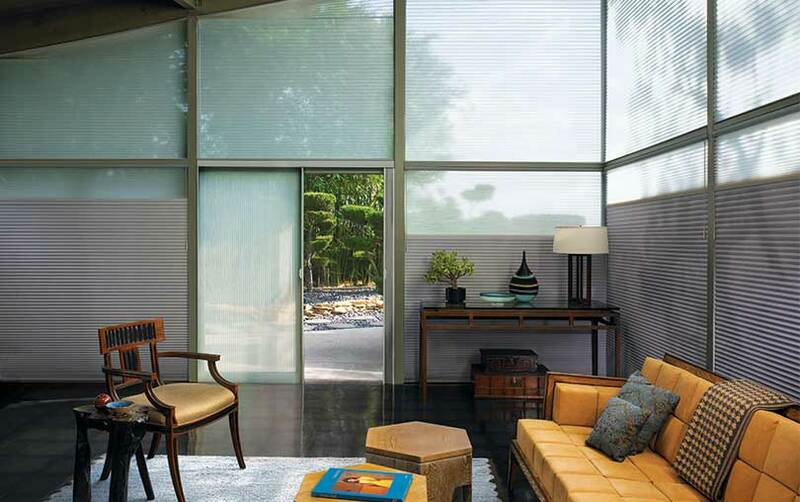 Learn more about Duette® Honeycomb Shades including sizes, colors and operating systems. 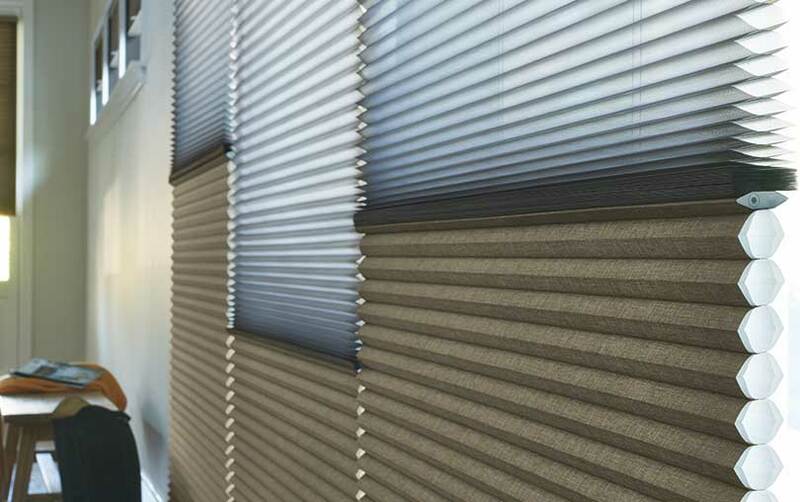 Pleated shades with Duolite® offer two opacities in a single shade. 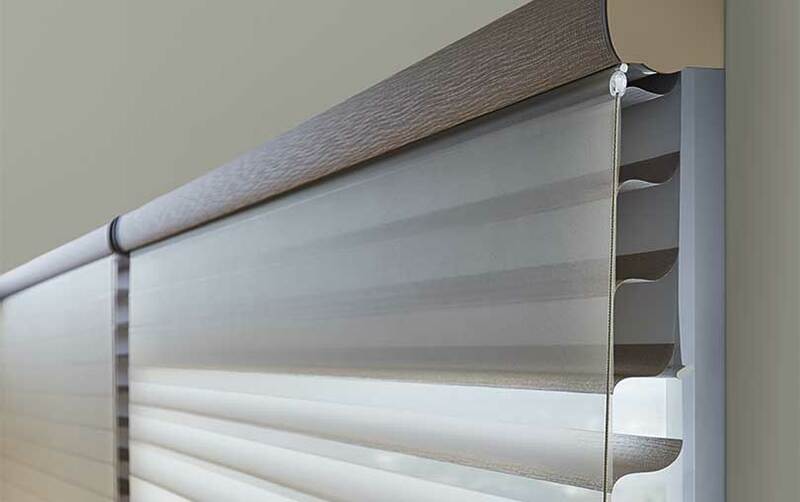 Close-up of Hunter Douglas Pleated Shades with patented Duolite® technology for maximum light control. The most economical of the Duolite® offerings, Hunter Douglas Pleated Shades with Duolite® offer a crisp, clean and modern look that simultaneously combines softly diffused light with room-darkening privacy. 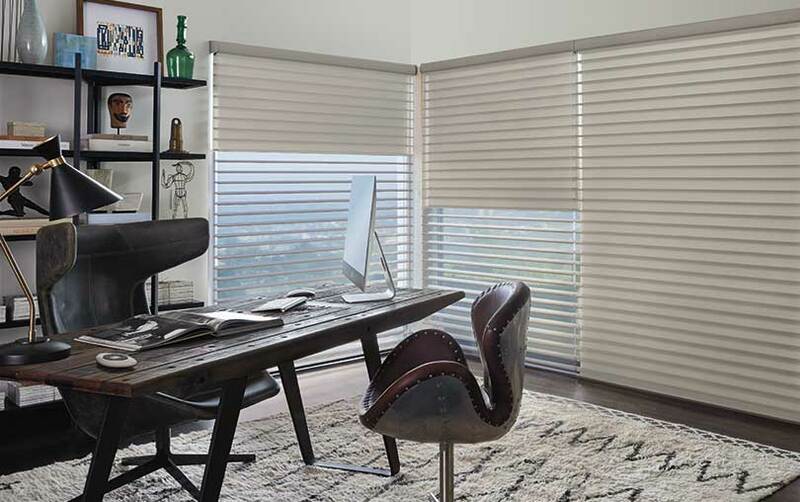 Learn more about Pleated Shades from Hunter Douglas including sizes, colors and operating systems. Duolite® is one room darkening option for your windows. 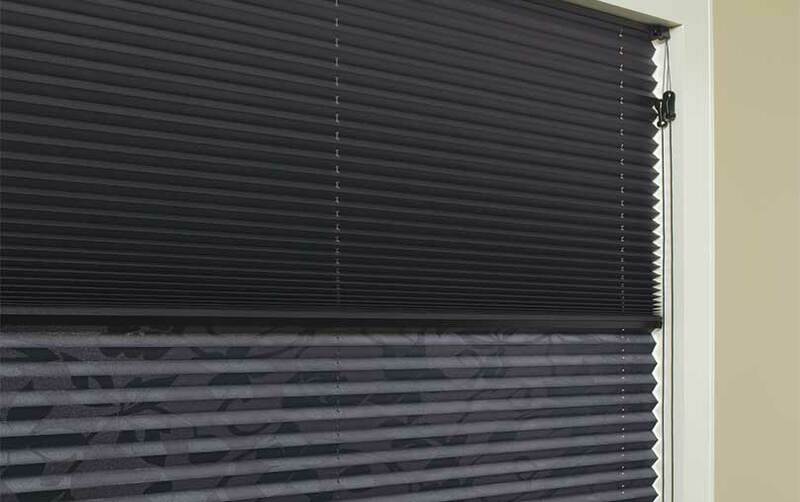 Other types of blackout systems for your Hunter Douglas window treatments include LightLock™. LightLock™ is currently available for Hunter Douglas Duette® honeycomb window shades. It is the most complete light blocking system available, featuring rows of specially shaped micro-ridges that are optimized to absorb or deflect all incoming light, while preventing the light from seeping into the room — even around the edges. Learn more about window shades with the LightLock™ system.